Phlebotomy Training Group > Blog > Career Advice for Phlebotomists > Is a Phlebotomy License Necessary? A government authorized authority gives a phlebotomy license to a phlebotomist to certify that she is a professional who is licensed to practice phlebotomy in that specific state. 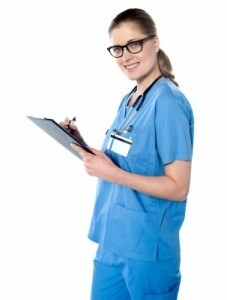 Some states do not require that you obtain a phlebotomist license to practice phlebotomy. However, Louisiana and California have strict regulations concerning this issue. In these two states, the Department of Health Services generally gives the phlebotomist her license. To obtain a phlebotomy license, you are usually required to complete an approved phlebotomy program. A state issued license testifies to your ability as a phlebotomist. You need to sit for an exam that is conducted by one of the certifying organizations in the state you intend to practice phlebotomy. To be eligible to take this exam, you must meet certain standards. These standards are determined by each state’s Department of Health Services. You are required to have experience as a phlebotomist. The minimum amount of experience differs. You can check with the State Department of Health to obtain this information. Phlebotomists who want to practice in California are required to have at least 1,040 hours of laboratory experience. To download the letter of phlebotomy experience form for California, click here. Even laboratory technicians and medical assistants, who practice phlebotomy, can obtain a phlebotomy license. If you are seeking licensure in California, you can view the Department of Health Services certificate guide by clicking here. In Louisiana, phlebotomists that work independently and in laboratories are required to be certified. To find out more, visit the Louisiana State Board of Medical Examiners site by clicking here. The field of phlebotomy continues to grow. The demand for professional phlebotomists increases every day. Numerous institutions now offer training courses to those interested in becoming phlebotomists. The majority of these programs train the students well, but there are some that do not meet the standards set forth by California and Louisiana’s Department of Health Services. This is why obtaining a phlebotomist license is so important. It ensures the employer that you have the skills required to work as a phlebotomy technician in their state.